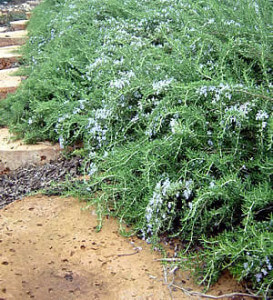 Emu Bush (Eremophila maculata) is a medium-sized shrub with small, round green leaves and a dense, symmetrical growth habit. Native to Australia, this tough, evergreen shrub is becoming popular here in the desert southwest where it is valued for its low water requirements and its long winter bloom period. 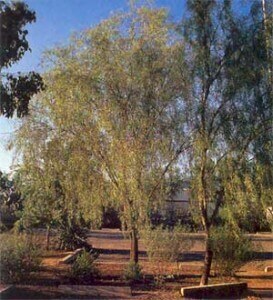 It is tolerant of heat, alkaline soils and drought. 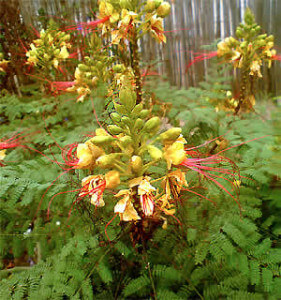 It grows to about 5 feet tall with an equal or greater width. From mid-winter to spring emu bush is covered with an abundance of tubular, rosy red flowers that grow along the tips of its branches and attract hummingbirds. Flowering starts in January, reaches its peak in February and tapers off in March. Several cultivars are now available including Eremophila maculata 'Valentine' which blooms just in time for Valentine's Day. Use emu bush along city roadways and medians, driveways, walkways, as a foundation planting or a focal point. 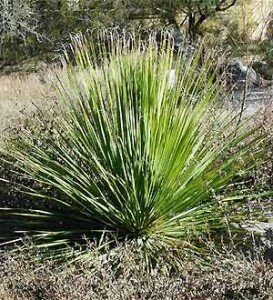 Emu Bush grows in almost any well-draining soil but does poorly and is short-lived in heavy clay soils that are consistently moist. Plant it in the fall or spring. Emu bush grows best in full sun locations and can take plenty of reflected heat. 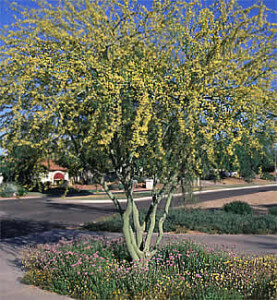 Although this shrub is drought tolerant, it will need some supplemental water here in Tucson, Arizona. Water established emu bush every two to three weeks. Minimal irrigation will cause its leaves to become smaller and turn a gray-green color. Also, the blossoms will not be as abundant. With a little more irrigation, it will become a show stopper when in bloom. If not pruned, emu bush will be more open and angular. With pruning, a more dense and bushy plant will result. Since the flowers are born on new, young wood, an annual shearing in late spring will guarantee a more prolific bloom the following winter.